People have the right to feel safe and be safe at work, at home, in the hospital or at any other facility. 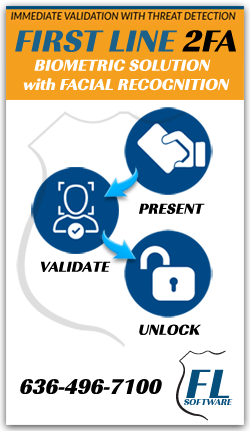 Knowing who is on the premises, and whether they are a threat to the safety and security of people and property, is recognized by security experts as the most important first step in preventing an incident. Blue Line’s intelligent facial recognition software, First Line, bridges an important gap in existing security systems because it automatically reads and recognizes every face that approaches one of its cameras. The software will automatically send alerts by text or email if it detects a threat. First Line intelligent facial recognition software is a live, video surveillance security software. First Line integrates with other security systems including turnstiles, metal detectors, CCTV, and because you cannot expect a security guard to know every face, it makes guard services more effective too.